Scafata is a traditional Italian dish with sautéed vegetables such as peas, artichokes, and asparagus that is perfect for seasonal vegetables. If you are looking for a way to incorporate some savory flavor to your healthy diet, this Prosciutto di Parma Scafata is the recipe for you. Asparagus and prosciutto go hand-in-hand, but who knew combining peas and prosciutto could be a winning combination of sweet and salty? 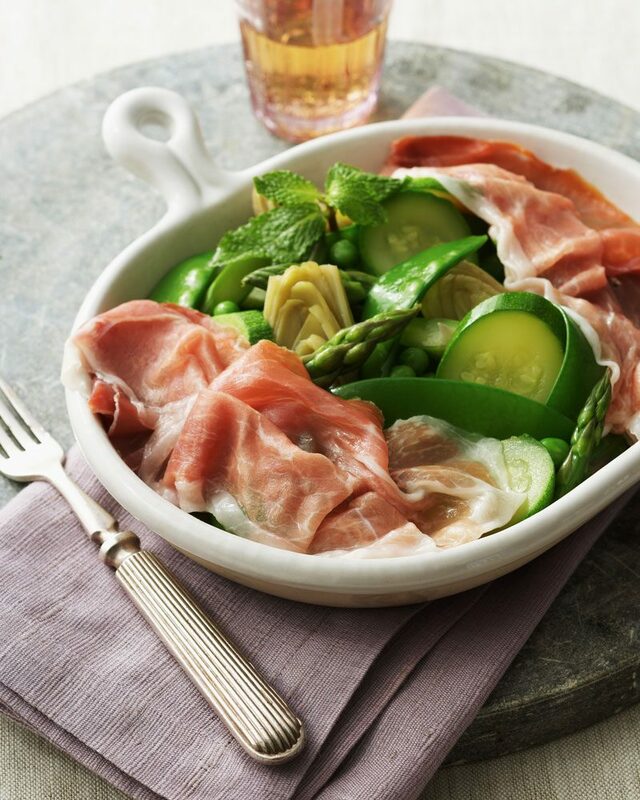 With the fresh mint to top it off, this asparagus and prosciutto recipe will become a go-to prosciutto dish for a light, healthy dinner! In large skillet, combine wine, oil and onion; cover and bring to boil over medium-high heat. Add zucchini, snow peas, peas, artichokes, asparagus, salt and pepper. Reduce heat, simmer partly covered about 5 minutes, stirring frequently until vegetables are crisp tender. Divide vegetables among four plates; top vegetables with two slices Prosciutto di Parma. Garnish with chopped fresh mint, if desired.